Accepted Papers written in English and registered were published in Proceedings by Springer and indexed by Scopus. DSIC’19 – The 2019 International Conference on Digital Science, to be held at Limassol, Cyprus, 11 – 13 October 2019, is an international forum for researchers and practitioners to present and discuss the most recent innovations, trends, results, experiences and concerns in the several perspectives of Digital Science. An important characteristic feature of Conference should be the short publication time and worldwide distribution. The main idea of this Conference is that the world of science is unified and united allowing all scientists/ practitioners to be able to think, analyze and generalize their thoughts. The concept of this conference is that all scientists have the ability to think, analyze, and extend knowledge using digital technology, and that technology allows researchers to break the barriers between disciplines. DSIC aims to efficiently disseminate original research results in natural, social, art& humanities sciences. This Conference enables fast dissemination so conference participants can publish their papers in print and electronic format, which is then made available worldwide and accessible by millions of researchers. DSIC covers publications on many multidisciplinary levels but each accepted paper might be presented in the appropriate thematic Conference session of narrow specialization. The conference organizers believe that all scientists selected to present their work are important in their own right, therefore additional keynote speakers are unnecessary. We are pleased to invite you to submit your papers to DSIC’19. Papers must be written in English and related with one or more of the Conference Topics (see below). All submissions will twice «blind» review on the basis of relevance, timeliness, originality, importance, and clarity of expression with convincing argumentative. Besides globally relevant meetings with internationally representative program/scientific committees guaranteeing a strict peer-reviewing and paper selection process. 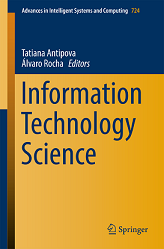 Accepted and registered Papers will be published in Proceedings by Springer in a book of the Advances in Intelligent Systems and Computing series and then submitted to Scopus, Google Scholar, Web of Science (ISI). Payment of Registration, to ensure the inclusion of an accepted paper in the conference proceedings: September 30, 2019. Accepted Papers written in English and registered were published in Proceedings by Springer and submitted to Web of Science, Scopus indexation.